Optimism is higher than ever on a group of stocks that have specialized in disappointment. Already in November, the value of American financial firms has been inflated by more than $300 billion, the most ever for the group as it benefits from optimism over Donald Trump’s presidential plans. Dealers are charging next to nothing for protective options and short sales are being covered in droves — all for stocks that have punished bulls every time comparable bouts of euphoria took hold since 1990. The catalyst is Trump, whose election, according to Macquarie Group Ltd. analyst David Konrad, will usher in a “new world order” for the industry, raising trading, dismantling regulation and boosting rates. With investors gripped by what Evercore ISI’s Glenn Schorr called a return of “animal spirits,” skeptics wonder who’s left to buy. Right now, that’s not advice anyone is heeding. In options, the price of puts for the biggest financial ETF has collapsed relative to calls this month, with a spread known as skew reaching a one-year low, three-month contracts compiled by Bloomberg show. 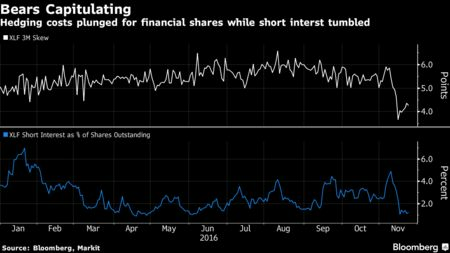 Short interest on the ETF slumped to about 1 percent from almost 5 percent. In the past, returns in bank shares have been poor when demand was this elevated. 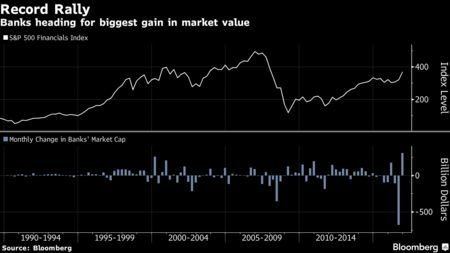 Three times since 1990 when the market cap of the S&P 500 Financials Index increased by more than $200 billion, the result was pain, with the gauge down about 8 percent three months later, data compiled by Bloomberg show. The latest reversal was in January. After embracing financial stocks in the last months of 2015 with bets that higher interest rates would stoke an earnings renaissance, bank bulls found themselves saddled with losses as the Federal Reserve’s first hike in almost a decade sparked concern over an economic recession. The financial gauge jumped 5.4 percent in the fourth quarter, only to slide a similar amount three months later. Banks and insurers have jumped 12 percent since Trump’s victory, almost double the next best performer in the S&P 500. At 1.3 times book value, the group was valued at a multiple that’s 60 percent above its five-year average. Fear of missing out reigns. The Financial Select Sector SPDR Fund, the largest exchange-traded fund tracking the industry, has lured more than $5 billion in November, poised for the biggest inflow since its inception.